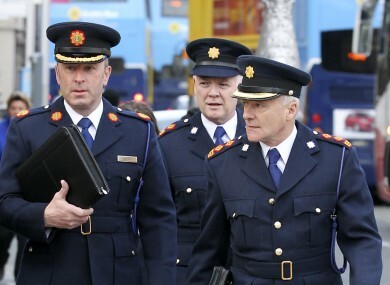 Assistant Garda Commissioner John Twomey, Superintendent Cornelius O Donohue and Garda Chief Superintendent Michael O' Sullivan arriving at Leinster House this morning. GOSAFE SPEED CAMERAS record 7,375 hours of driving in more than 700 locations across the country each month. Assistant Garda Commissioner John Twomey of the Garda National Traffic Bureau told the Oireachtas Transport Committee that the average compliance in the 727 monitored zones was above 90 per cent. However, he added that excessive speed remains “the number one road safety problem” in Ireland. Twomey noted that despite an annual increase in road deaths to 190 in 2013 – up from 161 in 2012 - the number represented the third lowest ever recorded. He said that there had been more than a 50 per cent decrease since 2006, when 396 people died on our roads. Twomey stated that “speed enforcement zones” were chosen based on “the analysis of five years of collision data”, adding that the “simple, single, sole objective [of the zones] is to reduce road fatalities”. “We focus more on certain areas than others because of that collision data,” Twomey said, adding that the system was “under constant review”. When compliance rates in an area increase, new zones are added. Twomey said three in ten road deaths are related to speed, but that there had been a 40 per cent reduction in speed-related fatal collisions last year. The Garda’s speed camera operations were outsourced to GoSafe in November 2010 and became fully operational in March 2011. When questioned about a Prime Time report broadcast earlier this month in which a former GoSafe employee said that some motorists incorrectly received penalty points for speedings offences , Cornelius O’Donohue, Superintendent of the Garda National Traffic Bureau, stated that this occurred due to “how equipment was set up, not equipment itself”. He said he was confident that the GoSafe cameras and vehicles were operating to the “best and highest standard”. Twomey said that data from every collision is shared with the Road Safety Authority and the National Roads Authority. He added that an Garda Síochána worked with local authorities to help reduce road fatalities by focusing on the 3 E’s: Enforcement, Engineering and Education. Twomey said that comments made by Judge Patrick Durcan at Kilrush District Court last month about the failure of securing speed-related convictions being a “complete waste of public money” indicated “the process more so than the legislation” is at fault. He added that there were no “systemic issues” in this regard. Fine Gael’s Patrick O’Donovan questioned how people charged with speeding offences can fail to turn up in court and use the defence that they never received a summons. O’Donohue said that the success of this defence “varies depending on how the judge feels about the evidence provided on the day”. changes how Gardaí serve summonses and gives the driver an additional opportunity to pay their fine. Email “Speed cameras record more than 7,000 hours of driving each month”. Feedback on “Speed cameras record more than 7,000 hours of driving each month”.